Whether you are getting ready to buy a new car and trying to decide between a manual or automatic transmission, or you are just curious about manual transmissions, in today’s blog post, Tran Star Transmission would like to share with you some of the key advantages of a manual transmission. If you are in need of transmission repairs, replacements, flushes, or a simple maintenance checkup, stop by our Houston transmission shop today! Give us a call at (713) 574-1473 to learn more or to schedule your free diagnostic check. The use of manual transmissions have been on a steep decline since the onset of the automatic transmission in 1940. In fact, roughly 20 years after the advent of the automatic transmission over 80 percent of all American-made cars featured an automatic transmission. Nowadays, less than 10 percent of all vehicles are manuals. While this number will probably never go back up, there are certainly benefits to manual transmissions. What Exactly Is a Transmission? Before we get into the thick of it, we want to offer some information for all of those who are unsure of exactly what a transmission does. Transmissions are the powertrains that convert the engine’s force into a controlled source of power. Without transmissions, vehicles would be, well, useless. In order for your engine to power the wheels, it needs the transmission to cover the power into the rotational force, called torque. This force is then transferred to the axles, giving you the ability to control the speed of your engine, keeping your engine and wheel’s RPM at optimal rates. Perhaps the greatest advantage of opting for a manual transmission over an automatic is the price you will pay at the dealership. Traditionally, vehicles equipped with manual transmissions will cost $1,000+ less than their automatic counterparts. Sometimes, this number can be even higher. The reasons for this price difference is because of the low demand and the simplicity of the mechanism. Because manual transmissions have a simpler construction with fewer parts, they are naturally easier and cheaper to maintain. 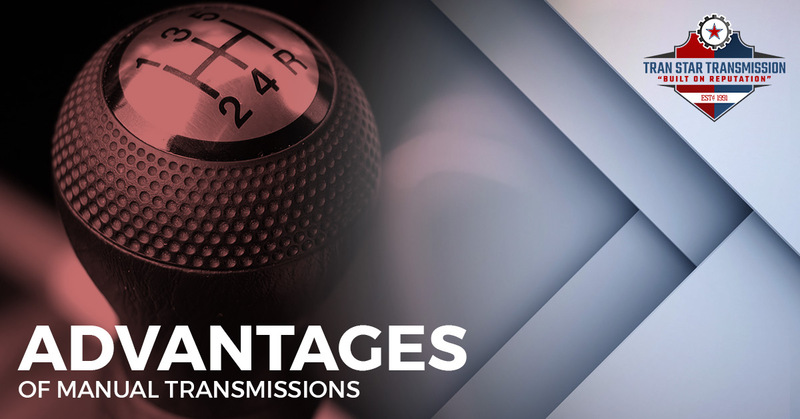 Unlike their counterparts, manual transmissions require less regular maintenance, and when they do require service, this will typically cost as much as an oil change. Manual transmissions are inherently less complicated, meaning fewer problems. Not only are automatic transmissions prone to more problems, but repairing these problems is typically more costly. For manual transmissions, the most common repair is a clutch replacement, which can stay in good, working condition for hundreds of thousands of miles. Although recent auto advancements have been able to improve the efficiency of automatic transmissions, traditionally, manual transmissions have offered better fuel efficiency than automatic transmissions. The primary reasons for this are that drivers are able to optimize their driving performance and manuals offer lower power loss. When driving a manual vehicle, you have to physically engage each gear change. This ultimately gives you total control over your machine. For car enthusiasts who love driving, this is a dream and a sure way to add some fun to your morning commute. Even for cars of the same make and model, the cars equipped with manual transmissions typically offer better acceleration, less weight, and less power loss. This is also why you will almost always see high-performing sports cars with manual transmissions. It is the standard, no-brainer choice for performance. As we mentioned, there is a bit of a learning curve for operating manual transmissions. This is, of course, learning how to properly shift. Because of this, many people have never seen the appeal and have, therefore, never learned the ropes. This could actually be an advantage for you. It might function as a theft deterrent, reducing the chance of your car being stolen. If you are in need of transmission services — transmission repair, transmission flush, transmission rebuild, and more — stop by our Houston transmission shop. Learn more about us, our services, and contact us today for more information.